The Millennium Falcon gets the Haynes treatment! 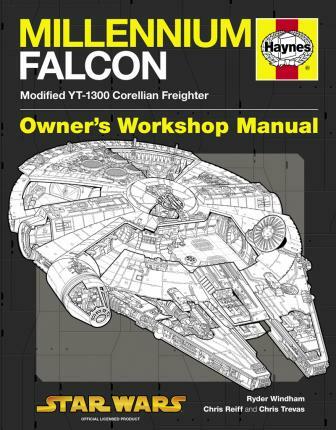 This is a Haynes manual based on the Millennium Falcon, the iconic spaceship piloted by Han Solo and Chewbacca in the original trilogy of Star Wars films. Using brand-new, full-colour cutaways, together with other art and photographs, this manual provides the most thorough technical description of the Millennium Falcon available, making it essential reading for all Star Wars fans. History of Corellian Engineering, the YT-series and the YT-1300. Millennium Falcon operational history (previous owners and modifications). Piloting, propulsion, weapons and defensive systems. Engineering systems and sensors. Crew facilities: quarters, medical bay and recreation. Flight notes: practical and tactical information on flying the Falcon. Ryder Wyndham is the author of over fifty Star Wars books and is highly regarded by Lucasfilm and Star Wars fans. He lives in Providence, Rhode Island with his wife and two daughters.